Once again, my husband invented a brilliant toy that entertained the children for the entire evening. In my daughter's words. "He opened his car, and took out the water bottle. Then he poked a hole in the lid (with a nail) and filled it up with water." He used a nail to poke the hole. 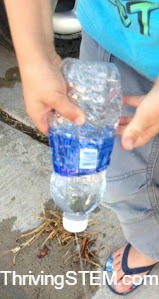 Both kids enjoyed applying force to the bottle and seeing the water come streaming out. The force was spread over the area of the bottle (pressure). When the water quit streaming before the bottle was empty, the solution was to allow air to enter, re-inflating the bottle so more pressure could be applied. The harder they squeezed (the higher the force and higher the pressure) the faster (higher speed) the water streamed out. The more they sprayed Mommy, the faster she ran.